We are in need of volunteers for a number of exciting events we having coming up! Maybe you could help as a one-off, or would like to make some new friends, or having something a bit extra to put on your CV? We also need help with preparation for the events, such as driving the van or helping set up the stall, even if you are unable to stay for the events themselves. If you fancy helping out at any of our events check out our events page for details of what's coming up including the Sutton Veny Flower Show, that's on Sat 14th July and is always a fun time. We also have the Frome Cheese Show on 8th September, which is always hugely successful and great fun! We will be there again this year and would love some extra help! 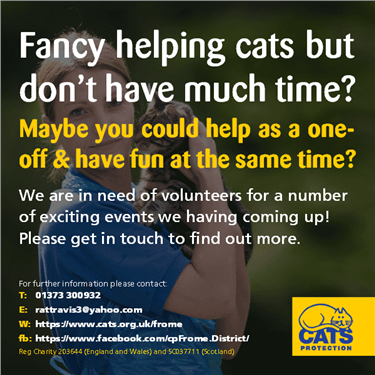 If you can help with any of the above, please give our Volunteer Fundraising Co-ordinator, Ruth Travis a call or email – rattravis3@yahoo.com or 01373 300932.